We all know the warning signs. The sink takes a little longer to drain. You begin to notice water pooling around your feet in the shower. And the odors. The strange, unpleasant odors. They're all signs that you may soon be facing a clogged drain. And then one day, boom. Your drain is blocked completely. It's something you need to deal with quickly, or face the wrath of a burst pipe or a useless bathroom. Simple enough, but surprisingly effective. Take a regular wire coat hanger and straighten it out as best you can. Then, bend one end over to create a small hook. Push that past the drain cover and start fishing. You should be able to get all sorts of hair and nasty stuff out of the drain. Remember, you always want to be pulling gunk out, not pushing it further. When you've got as much out as you can, run the hot water, and it should clear things up nicely. If you have a wet & dry shop vacuum, it can become a terrific tool to unclog drains. First, set it to vacuum liquids. Cover up the vent to prevent a mess. Then, create the tightest seal you can over the drain. You may want to get creative and adapt an old plunger head for this purpose. With the vacuum turned on its highest setting, it can be powerful enough to draw the clog up the pipe and into the vacuum bag. It doesn't always work, but it's worth a shot. Tips don't get any easier than this. Put the kettle on (or use the stove or microwave if you don't own a kettle) and boil up as much water as it will hold. Now pour it slowly down the drain in two to three stages, allowing the hot water to work for a several seconds in between each pour. This is usually the easiest and quickest way to unclog a drain. If there's any water left, congratulate yourself with a cup of tea. There are some plumbing jobs that I won't do, but this one is easy. First, place an empty bucket underneath the U-shaped pipe (the trap) beneath the sink. The bucket will collect the water that will spill. Using a plumber's wrench, loosen the slip nuts at both ends of the pipe. You should be able to finish the operation by hand. When the trap is free, remove it and turn it upside down, emptying the contents into the bucket. You may also need to fish around inside it for debris, and do the same with the pipes that were holding it. An old toothbrush is good for getting the tough gunk out. Rinse the trap with water and then put it all back together. In most cases, that will have done the trick. This is a fairly low-tech piece of equipment that works wonders. It's basically a long flexible metal rope with a spiral of metal at the end. The following video shows you just what to do. If your toilet is clogged, pour 1/4 cup of dish detergent in the bowl. Then boil some water. The dish soap will act as a lubricant and help break up any greasy residue. Then pour the hot water down, and get ready to start plunging. If the plunger doesn't cut it, rubber gloves may be the next option. I bought a small plunger designed for sinks (the typical one would have been too big to create a seal and it's kind of gross to use one that you'd used in the toilet anyways), and that worked like a charm to unclog a drain that had been giving me fits since we moved in. I had tried many of the suggestions you listed as well as Drano and the standard fare. All provided temporary relief but it was the plunger which really did the trick. Warning #1: The plunger 'brought up' some particularly vile contents into the sink so be prepared to clean up. Warning #2: Using the plunger loosened up contents which not only backed up into the sink but also into the area that provides the overflow drain. You'll want to flush this with boiling water immediately to rinse the loosened up matter down. Still, it worked like a charm and draining a half-full basin went from a two minute process to roughly four seconds. Because of your comment, I used my regular plunger, that I never use, on the sink. I spent 4 seconds on it like you and fixed the issue after messing with it with a coat hanger for 15 minutes. Many thanks! All good tips. I've tried several of them. But the best plan is to keep the drain from getting clogged to begin with. You can buy little rubber caps with perforations to fit over your drain. If you clean out the hair caught in it each time you bathe, you'll have many fewer clogs to clean out. You missed Zip-It, it's a $3 piece of plastic with teeth on it, slide it down the drain all the way then slowly pull up. The teeth hook onto all the nastiness and pull it right up. I think they're supposed to be disposable, but if you just use a plastic bag to pull the gunk off in the opposite direction of the teeth, a quick soapy rinse and you can use the tool again and again. Fixed in 5 mins a drain issue I'd been battling with water/draino/etc... for years. I second the Zip-it. I was skeptical, but one try and I was hooked. Also, if you have plastic pipes you do need to be careful about the hot water. Lengthy exposure to boiling water can be bad for the pipes. And maintenance is key. Try to keep stuff (including hair) from falling in the drain, and clear the pipes occasionally to cut down on residue inside the pipes. I fill my sinks with hot water periodically, then open the drain to let it clear the drain. I also periodically use the baking soda/vinegar/hot water treatment to keep the drains clear. I have owned a zip it and I will tell you how you can make your own if you can't locate one in your local retail hardware store. Besides, you might need it right now. You will probably be able to find what you need in the garbage bin of your local hardware store so don't leave without getting a handful. What is it you ask? The plastic strapping material used for boxes and lumber. It could be yellow or white thick plastic strapping material about 3/8 of an inch wide. The thicker the better. I recently pulled some from a box of paper and noticed it was thinner. Next just take your scissors and nick both sides of the strap with 1/4 inch cuts at an angle probably about a 75 degree angle all along the strip. Hopefully your strip is about 3 feet. Nick as much you want, making sure you don't cut through. When your done, and it will probably take you no more than 2 minutes to make your own, you will have a free "grip it" and you will have it for free. Works as well or better than the one you buy at the hardware store. The problem with the zip it is that you usually can't find it when you need it thus the homemade version I came up with. I refuse to buy something like that twice. Now don't blame me if this goes wrong for you, but after trying most if not all of the above tips on a badly clogged bathroom sink, and resenting the payment of $150-250 for a plumber, I watched several videos on You-Tube about clearing and/or replacing sink traps and did it myself, slowly and carefully. It was startlingly easy. The trap was pretty stuffed, but there was also a fair amount of gunk in the pipe into the wall, which I could never have reached without removing the trap. The trap was fine, so I just reinstalled it. The clog was gone, there were no leaks, and the whole thing, including watching the videos, took about an hour and a half. I could have easily wasted a full morning or afternoon waiting for a plumber, so I not only saved money but time. OK, when I needed to replace my water heater, I called a plumber (and learned from him how to check the expansion tank and drain sediment), but I've tackled several other plumbing problems in the last three years successfully, using You-Tube 'tutorials' to guide me. One other really super handy tool you can use which has literally saved me over 1,000.00 on an outside drain, is a bladder type tool. It comes in different circumferances and attaches to a garden hose. You need to fit this bladder tool which has been attached to your hose down the drain pipe. Once in you turn on the water and wait for a few minutes till the bladder fills and the force of the water pushes the clog out. Before I found this tool, I spent 800.00 on 2 occasions having the plumber come out with his water jetting equipment to clear a clog in my extremely long run to the street. That bladder for the large outdoor pipe cost me 20.00. I used it a second time so it cost me a total of 20.00 for what would have cost me 1600.00 had I had to have that service performed. These tools are extremely effective if you get them down the right pipe. I had one case where I couldn't get into the bend so I had to get a plumber to come out. He pulled a huge wad of steel wool out of that pipe Every other time these bladders have been a life saver for me. The smaller sizes are cheaper, under 10.00 probably. They can be used over and over. Warning, the bladder has to fit inside the pipe so that the bladder can expand and fill the pipe hole so you have to use the appropriate size. Thanks for all the great tips guys, these are excellent! And please, keep 'em coming, i appreciate them and so do our other readers. I do have one more. There is a product and I am sorry but I don't know the name of it, but it uses canned air to blast your way through the clog. I have found this product to be useful without the use of chemicals. It usually comes with more than one treatment to a can. I found one on amazon I won't name names, but Power Plumber Pressurized Drain cleaner is a search name you can use. The ones I had were named something else (can't remember) but I haven't seen them retail since I bought mine at a yard sale. I take drain cleaning as a multi pronged approach, you need several tricks in the bag for the drain you are working on. I am a landlord, so I try to keep available several options. Another tip I read somewhere was for a hair clog. The guy said his wife got her hair removal cream for her legs out and poured some in and that did the trick. so I guess I just gave 2 here. That hair removal cream sounds genius. What kind of clog were they dealing with? Was it just for a sink clog or was it a clean out pipe or where was the clog? I used to have the drain stopper in my tub hooked up to this big metal thing that went down into the drain. It made it hard to plug the drain to take a bath so I finally removed it. Before I removed it I had to take it out from time to time and clean it off when the tub started draining slow. It would be full of hair that it caught when I pulled the plug to drain the tub. My hair sheds a lot, there would be so much hair I would have to cut it off. Ever since I took the stopper off that big metal piece inside the tub there is nothing catching the hair and the drain gets really clogged. So I started buying things to catch the hair to no avail. Nothing seems to work, we snaked the pipe from the roof and it worked for about a month and it is back to taking hours to drain. Seeing that the clog in pretty far down the pipes do you thing that the Nair would work? Wow, the wet&dry vacuum worked great for me! For slow bath drains because of hair, check out The Drain Claw at www.thedrainclaw.com. It is a simple tool to unclog a bath drain without chemicals. Or spend $200 on a Kinetic Water Ram. The simplest way to kiss your plumber goodbye. Pays for itself the first time you use it. Easy way is to get a tupperware cover (it's better if it is thin) then put it on the sink hole and start to pump. Remember, just like doing a CPR. PUSH HARD AND FAST. Repeat it and remove it quickly. Then check it if it works. and Voila! If it doesn't, don't give up. Keep it up! God bless! Wetvac worked perfectly for me. Word to the wise - second time I've fixed a kitchen drain with eggshells being the culprit. Chemicals and plunger did not work for me. Now it's messed up my dishwasher. Onto the next challenge. Time for a plumber. None of that worked for me. I have used the drain clog removing tool Drain-FX. When my kitchen sink drain clogged with food, grease and hair, I initially tried removing the clog with plunger, but nothing happened then I also tried using the chemical mix Drano which was giving me a headache but that too didn't work out then I googled and found this product Drain-FX. It is so easy to use since it comes with a step by step instruction manual, all you have to do is connect the tool with your tap in the sink and let go the tap water, the tool then creates a pressure washer effect which flushes out all the clog that has accumulated in the drain, within minutes you will be able to see the water gushing out of your drain. I also bought one for my sink (Drain-FX Sinks) and another one for my tub (Drain-FX Plus). You can buy them from their website drain-fx.com). There is no chemicals, no plumbing charges and no mess or complications in using this tool it is so simple and easy to use. Vinegar and Baking Soda are the best, boiled water also helps. But i hate using old plunger method. Last time i tried to use a cable that also helped. Tried hot water and baking soda/vinegar methods but unsuccessful. Gave the wet/dry vac method and was able to get a lot of particles out. Hopefully that did it. Crossing fingers. Thanks wisebread.com! Thanks for these tips, I never thought there were so many ways to deal with a clogged drain. Maybe I can give one of these a try instead of taking apart the trap next time. Do you think they would be beneficial for drain cleaning as a way to prevent blocks? Thanks for the tips! I have one bathtub clogged with hair and one kitchen sink clogged with nasty food garbage, despite having bought and used drain catchers for both. The boiling water looks like it's going to work on both, though. Vinegar and baking soda are, indeed, the most useful natural products for cooking and cleaning the house. Clogged drains can definitely cause flood that may turn the situation into a more serious one. So it is advisable to fix this immediately. Those pieces of advice are all beneficial to a lot of users. Thanks for sharing! 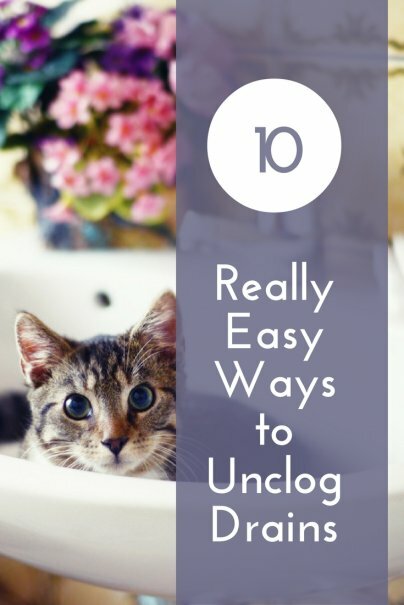 I'm surprised other than another reader commenting that using the plunger method isn't mentioned in this list. Whenever my tub clogs up, I block up the overflow hole with a wet towel and use a plunger to clear the drain. It works every time. Once I plunge out the drain and the water is flowing again, I put baking soda and vinegar in there and let it sit for a while. Living on the bottom floor of an older three story apartment complex, I get drain water from the above apartments in my kitchen sink and the tub tends to clog up once every few months. The first time, I had a plumber come in and fix it but when I saw what he did and how simple it was, no need to call again. Perhaps this does not work very often because no one tells people to block the overflow/air holes. It makes sense why it would not work otherwise. Does this work for clogs in the trap or down the line or both? Does this work in both the sinks and the tubs? If I understand correctly the clog in question last time was just past the 25 foot augers reach to get the whole thing. great list, and some other good advice from the commentors. (Go Zip-it) Usually the first thing I try i teh boiling water, if that doesn't work I'll clean the pipes. Thank you for the tips. The picture you painted at the beginning of this article describes my situation perfectly. Everything I've tried so far hasn't worked, but I'm hopeful that these drain cleaning tips will help me. I usually go with vinegar and baking soda, but you have really done a proper research on this. I will definitely try some of other methods in the future. Wow, these are some really great tips for a first time home owner. I had no idea that boiling water could help unclog a drain. It seems like there area lot of different ways to clean your blocked drains. Thank you - the hanger worked great and saved me money! Baking soda, salt, vinegar or lemon juice, boiling water and a plunger -- Voila ... that's all you need to fix that stubborn clog in your drain. I almost gave up but then I Google searched and found this webpage. Thank you for these tips. It sure worked after several attempts of using those ingredients and the plunger. Then after being persistent, the boiling water and ingredients slid down the pipes and everything worked in harmony with one another. Shortly after, I used the plunger and some arm muscles; the water then quickly drained down the sink like a charm and the problem was solved. If you have a lot of hair, junk or mess down the sink, you need to use more arm power to loosen that blockage with that wonderful plunger you bought and thought you would never use! This could be the best home made remedy, I had tried it and get the drain open. Cost effective and home made solution that gives best results. Need a product that's effective on clogged drains? Try Drain-FX! It's a revolutionary DIY plumbing tool that turns your average faucet into a high pressure drain cleaner. Drain-FX is available for purchase at your local Home Depot, see in store for more details. Or, you can purchase online by visiting drain-fx dot com. Oh wow, these are some pretty cool and common ideas that were provided when doing a drain cleaning. Some of these ideas are what I have been taught to do as well. The thing is, what will happen if the drain issue gets worse, would I need to call in the experts or find other solutions? NEVER , EVER, pour hot water into a cold porcelain toilet ! Answer number 9 is completely wrong. Hot water into a porcelain toilet full of very cold water leads to a cracked and leaking toilet. Don't use boiling water on a toilet that has a wax gasket. Melts. No longer seals. Blocks the drain. Freezing was new to me. I followed advice I found online. Some of it is wrong. Ok what is you've tryed 8 bottles of drano and a 50+ foot snake? What should i do now? If the toilet is continuosly clogging you might have to take it off the seal and look inside. If the plunger, snake and bucket of water do not solve the problem and it is repetitive you likely had something fall into the toilet. It maybe a hairbrush, toothbrush, kids toy, that got lodged in the curve of the pipe that is making the clog reappear. That is what the guy at the hardware store told me was common and sure enough when we took it apart, there was a cleaning brush that had gotten in there somehow. Just remember if you take it apart you must have a new wax seal to put it back together. You can find instructions to take it apart on youtube. This is about a $2 cure with a little elbow grease, some mopping thrown in. At first I could not get a good seal. I even went to a few stores to see if they had a rubber adapter for the end of the hose. No luck. I used kids' clay to make a seal around the drain to put the end of the vacuum hose in. It worked like a charm!!! And my sink actually drains - for the 1st time in 6 weeks. It sucked up what looked like motor oil. Yuck. WET & DRY VAC TO UNCLOG SINK DRAINS IS AWESOME!!!! Thank you for the great idea to use the wet & dry vac on the clogged sink drain. IT WORKED !!! Just be sure to make a tight seal around the hose and drain pipe, I used duct tape. Also, be sure to clean out your vac hose and the catch tub too. Thank you again and I hope this idea is useful to many DIY plumbers. What kind of drain did it fall in? I had a very stubborn slow drain in my bathroom, and after several attempts at using drain cleaner, I found that the 1/2 cup baking soda and 1/2 cup vinegar seemed to break up the buildup better, followed by 2 pots of boiling hot water and a few minutes of using a plunger. You have to stuff a wash cloth in the overflow hole at the rear of the sink in order to get enough power, but next thing I knew, the clog released and I was so relieved. Especially after Roto Rooter told me the night before that they were going to charge me $300 to snake out the pipe - NO WAY! I'm now a fan of the baking soda vinegar treatment and will use that in between to cut down on the toothpaste buildup, worked for me! Thanks for the advice! Salt and Baking Soda worked like miracle!!! Thank you for this info. I had poured two bottles of strong declogger down a bathtub with no improvement in slow drain. Today I did the baking soda & vinegar, then later tried it again, this time filling up the top & draining water after 40 min. Now its draining well!!! After spending 14.00 on two bottles of Drano realized it was the toilet drain not the shower drain that was clogged. Tryed your suggestion for Dish soap and very warm water. Worked almost instantly. Thank you very much!!!!! I'm a taker and a giver so I will share that if you live in an old home were tree roots that can interfere with drainage I read years ago that as a maintenance pratice throwing several hands fills of rock salt into your toilet bowl helps disolve smaller tree roots that can develop and interfere with drainage. After 2 rounds od liquid plumber u was ready to just call a plumber. Read this. Tried a coat hanger ... Boom ... Clog fixed! Thanks a lot!! I have been a handyman and now plumber for over 27 years. I am concerned that the advice above will cause tenants and homeowners trouble in the near and long term future. Primarily, I take issue with the coat hanger, caustic soda, and the hot boiling water methods. 1) i have seen my share of broken p-traps as a result of overzealous coat hangering. 2) caustic soda can blind .... especially if one tries it in conjunction with baking soda and vinegar or even coke and mentos... a gas bubble can develop and blow back caustic soda ... google warnings for liquid plumbr or draino and see the potential injuries that can result. such chemicals can also cause damage to pipes ... corroding them or at least making them weaker for some future coat hanger to puncture. Leaks in the wall are far worse in terms of damage and overall hazard (mold, dryrot, structural issues) than those you can see and easily get to. 3) the boiling water "trick" is actually one of the worst. warm water or hot tap water is ok.. but boiling hot water can damage the seals on drain pipes in the wall as they expand... again, the damage you can't see/the leaks you caused that you can't see are arguably worse than the clog you tried to fix... There is good reason why cookbooks tell you to run the cold water into the sink when draining pasta water that was just boiling on the range top. PLUS... there is a wax ring that tends to melt or leak after someone tries to use boiling hot water to clear a toilet. The subfloor will begin to suffer water damage, warp, mold/mildew, create an uneven base for the toilet in the future so more leaks occur, and anyone in the floor below will now become your worst enemy. It's irresponsible to pour hot boiling water down a drain or toilet... PERIOD. what do you suggest then? I have standing water in my tub right now... Tired from continuous plunging. I'm considering buying a drain auger. Is that a good move? I just tried the baking soda salt and boiling water option. It worked perfectly! The boiling water worked so well for all that may have an issue. I went and got some professional liquid plumber and sulphuric acid in the plumbing section from Lowes, then waited about an hour, and poured it down all my sinks, tubs, and shower. I had alot of boiling water. Remember to keep replenishing it and keep pouring behind the drain cleaner. It worked and mine had backed up in my tub and shower. Save me a call to the plumber. Great, now I've got a coat hanger stuck in my drain!